This ain't your daddy's Justice League International. 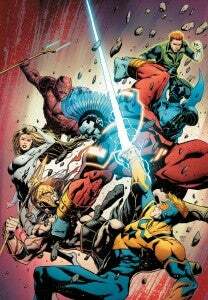 In fact, this ain't anybody's Justice League International. One of the only things that the Justice League International Annual #1 has in common with the just-concluded series is that it really ought to have been called "Booster Gold," although even that would have been odd since Booster (like everyone in this book) was written in such a way that it makes you wonder whether Geoff Johns and Dan DiDio have even been reading Justice League International since the company they head up launched it last September. After spending a year verbally sparring with Booster and finally coming to the conclusion earlier this month that the JLI is his home, Guy Gardner storms off early in the issue, accusing Booster (rightly) of having lied to him and the rest of the team in order to make the JLI seem like a more attractive place to be. None of this jives with any of what happened in the actual ongoing series, of course, and Gardner and Batwing--who remains behind following a bloody-but-successful international mission at the start of the book--are the lucky ones here. The entire issue is a reboot within the New 52 reboot, incorporating elements of previous histories that were never a part of the ongoing series and creating an environment where (as has so often been the case since the relaunch of the titles last year) it's not clear exactly what from the "old" universe does and does not count. The art is strong, but doesn't particularly suit Booster Gold as a main character. Fabok depicts Godiva and Blue Beetle beautifully, but Booster doesn't work at all, from a face that doesn't look consistent with any version of the character we've seen recently to an oddly thin hairline (maybe Giffen and DeMatteis were right!) to a coloring scheme that fails to capture the "metallic" look to his costume completely. Ironically, the dulled, grainy nature of the colors here works better for Blue Beetle than anything we've seen since the earliest issues of Jaime's first issue. The whole story seems pointed at resetting the series to the pre-Generation Lost status quo, with a lineup and a villain that evokes the feel of the Giffen-DeMatteis Justice League years, but without any of the heart and humor that made them work. O.M.A.C., one of the great character finds of the New 52, is relegated back to where he was during Infinite Crisis and its fallout--a mindless creature controlled by Maxwell Lord an anonymous master who seeks to destroy the JLI for reasons unknown, but related primarily to a desire to kill Batman, who designed the Brother Eye satellite that created it. The conclusion of the story features an interesting twist that brings Booster Gold, Volume II full-circle; Booster is visited by his older, more heroic and established self, who references Rip Hunter and has control over time. But it's twisted up a bit. Old Booster wears something that looks like a New 52 variation on the hideous "armor Booster" look from the '90s (shoulder pads, heavier general look, definitely low-tech, although the coloring issues described above make it hard to say exactly how much so), though, and his control over time seems limited to being able to briefly freeze it. "Rip's going to follow the chronal disturbance and try to erase this conversation," Old Booster tells his younger self, and then orders him to seek out Steve Trevor and the Justice League of America (who don't yet exist), apparently to help stop the pairing up of Superman and Wonder Woman, which has already happened, and which for reasons that pass understanding appear to destroy Booster's timeline and send both versions of Booster to a kind of invisible limbo reminiscent of when Marty McFly's parents weren't kissing yet. "I shouldn't have trusted--" he says as he vanishes, which may be Rip but (since those in the know, know he's Booster's son and Old Booster probably is aware of that by now) is more likely in reference to someone else. Who might Booster trust, but might betray him in a Geoff Johns-written, oversized one-shot that centers around the O.M.A.C. project? It seems likely this story is setting up a war between Steve Trevor's ARGUS (for which Old Booster is wearing a logo) and Checkmate, whose Maxwell Lord seems the most likely new "master" of Brother Eye. If nothing else, it's worth noting that he refers to Booster Gold as "Michael" over and over again, as Lord did throughout Justice League: Generation Lost. Such a war was teased during an interview we did with Jeff Lemire prior to the launch of the New 52, but at the time it was a showdown between S.H.A.D.E. and Checkmate, with DiDio (who co-wrote this issue) writing one half and Lemire taking on the other. Of course, at least one of those Boosters didn't really "die." Even money is that Rip brought the younger Booster to Vanishing Point, where he'll stay for a while until DC is ready to use him again in the Time Master role that was so well-established by Johns before the reboot. 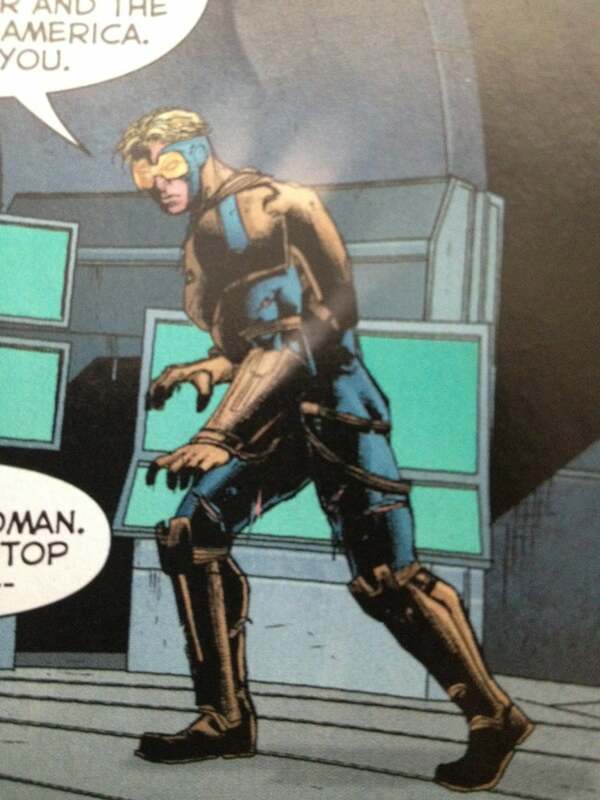 It's hard to imagine that will take long, since they've already started using Booster in the Blue Beetle ongoing, and it's unlikely we'll see Jaime stuck on Reachworld for very long.